When most people think about the most critical part(s) of an Optical Disc Drive (ODD), they typically think of the laser diode that reads the discs. Of course, that is a critical element and without it the drive cannot function. 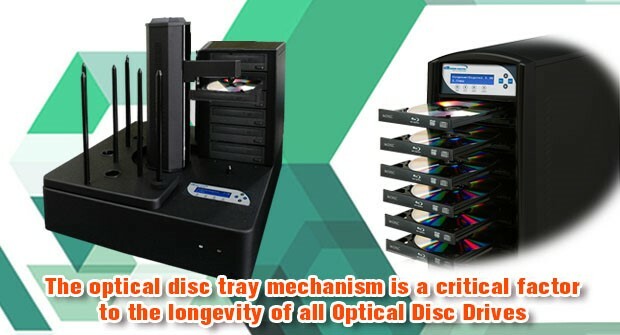 However, there is another critical element that is often overlooked and not given much consideration, the disc tray mechanism. That includes not just the tray itself, but also the gears, pulleys, and sliding mechanisms that allow it to extend and recoil smoothly and consistently. Often, because it’s not seen as critical as other components, because production drives are designed for single drive PC use, many manufactures don’t put much thought behind how to enhance it. The problem is that while a typical computer owner with an internal disc recorder drive may open and close the drive infrequently, a duplication equipment user will depend on those drives opening and closing potentially hundreds or even thousands of times a day. That’s why Vinpower’s line of duplication focused ODD’s ensure the drive tray is suitable for the real-world duplication environment. Vinpower’s PLUS and ROBOT PLUS drives are enhanced to allow thousands of in and out operation without failure. We physically modify each drive to handle the rigors of the duplication environment, especially for robotic autoloader duplicators. Autoloaders require extended trays with more give and flexibility while continuously offering consistent tray extension. Since Vinpower produces its own line of autoloaders, we are uniquely qualified to understand the complications and the abuse these drive trays endure day in and day out, so we are most qualified to design a drive tray mechanism to function under these specific conditions.